This cookbook makes my mouth water. The photos are incredible; the recipes divine! From Seedy Date Balls-Unbaked to Girl Scout Brownies, oh my oh my! I can’t wait to try all of these recipes. Best part of all, they are all allergy-free! 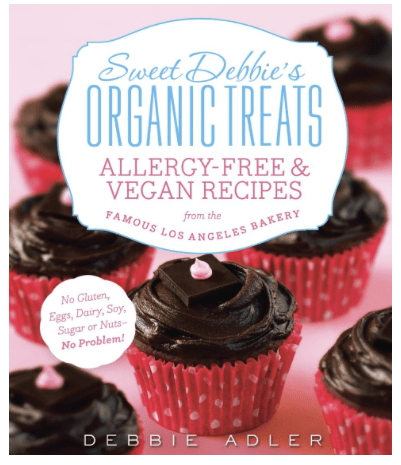 [amazon_link id=”0373892829″ target=”_blank” ]Sweet Debbie’s Organic Treats: Allergy-Free and Vegan Recipes from the Famous Los Angeles Bakery[/amazon_link], by Debbie Adler may be the best dessert cookbook I have reviewed, especially considering the quality of the ingredients. Coconut nectar, dried plums, buckwheat flour, etc., there is nothing to worry even the most sensitive stomach. Are you saying “no” to dessert because of food allergies or health concerns? Or saying “no” when your kid asks for a cupcake at a birthday party? If so, Sweet Debbie has a Chocoholic Cupcake for you! If you’re a vegan, diabetic, have celiac disease, a food allergy or an intolerance, or are simply interested in boosting your health via your baking tins, set the oven to “preheat” and sit down with Sweet Debbie’s Organic Treats. Your sweet tooth will thank you for it. I really want to visit this bakery in LA, but the next best thing is having this cookbook. Now, can I talk my daughter into baking for me this weekend?